Vocabulary refers to the collection of words a particular person, group of people, socioeconomic group, profession, and so on, knows and uses. The technical term for vocabulary is lexis. The active vocabulary is all the words used expressively (in writing, speaking or signing) and the passive vocabulary is all the words recognized and understood, although not necessarily used expressively. An adult’s passive vocabulary is about one third larger than their active vocabulary (Crystal, 2006). Different modes of communication (e.g. speech, writing, signing, telephone, email) often use different vocabularies. This is, in part, due to different contexts leading people to communicate their thoughts, ideas, and so on, differently. In an informal face-to-face conversation, for example, the communication takes place in real time and the participants have little time to pre-prepare what they wish to say. Consequently, the vocabulary tends to be restricted to a set of frequently used and familiar words. In contrast, in formal writing (such as a lengthy government policy document) the author has time to pre-plan the structure of what s/he wishes to communicate and to carefully choose the specific words that best convey the intended meaning. In addition, because it is not produced in real time, the author can go back over the work and revise it, correcting any mistakes, before it is released for publication. A quick way of highlighting some of these differences between modes is to examine the proportions of lexical words (lexical verbs, nouns, adjectives, adverbs) used in different modes. The following graph (based on a study of 4.3 million words) is from some work I did to explore the language complexity in speech therapists’ written reports. 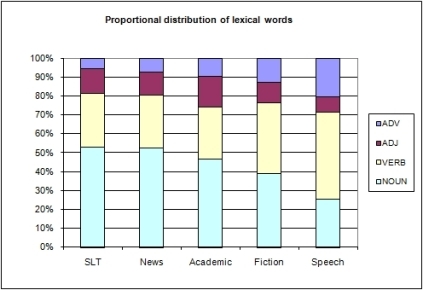 It shows the proportion of lexical words used in speech therapy reports (SLT), newspapers, academic writing, fiction writing, and in speech. There are some quite dramatic differences here, especially in the use of nouns and verbs. We see that SLT reports and newspapers use the most nouns (approx. 52%) and the fewest adverbs (approx. 9%). This is the opposite of what we find in speech. When speaking we use the fewest nouns (25%) and the most adverbs (21%). As well as describing vocabulary in terms of the types of words used (lexical words, function words, inserts), it can also be thought of in terms of such things as specialization and social function. Slang consists of highly informal, non-standard words and phrases. These are often colorful expressions formed by the creative and playful organization of words. Slang is generally avoided in formal speaking and writing. It usually has its origins within a particular subculture. However, if the subculture is in frequent contact with the mainstream culture then the slang words or phrases may become incorporated into the mainstream culture. Examples of slang words are bog, john, loo and can for ‘toilet’, spondoolee, moola, bread and wad for ‘money’ and wheels for ‘car’ (see Ayto, 1999; James, 1999). This is specialized vocabulary used by persons in the same work or profession. The specialized words are ordinarily only partially understood by outsiders. 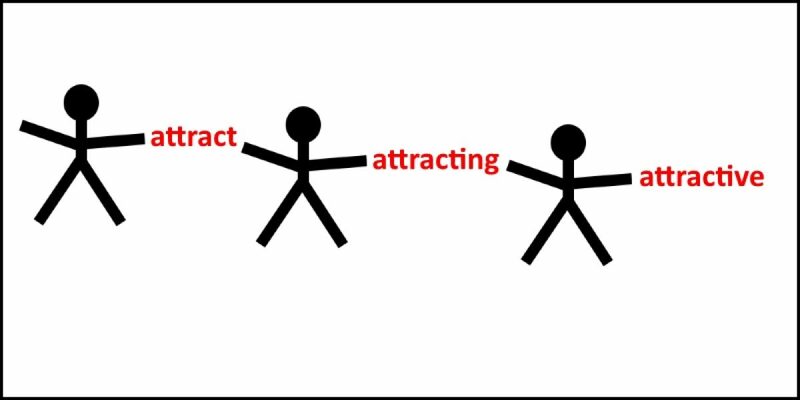 Jargon is useful for persons within particular professions because it allows members of that profession to communicate clearly and concisely with a minimum of ambiguity (see Burke and Porter, 1995). Examples of jargon within the speech and language therapy profession include dyspraxia (a reduced ability to perform purposeful movements of the vocal tract not attributable to impairments of motor or sensory functions), aphasia (an inability to use language symbols in order to communicate) and metathesis (the incorrect sequencing of syllables in words, e.g. when tiger becomes giter). This is sometimes referred to as argot and it is the secret vocabulary of underworld groups. Examples of cant as used by gangsters include snuff, blow away and waste which mean ‘to kill’. It should be apparent that the dividing line between slang, jargon and cant is quite tenuous. Words that begin as cant, such as waste and snuff, may eventually become slang as they are promoted throughout the mainstream culture through cinema, modern novels, music, and so on. A person’s vocabulary develops rapidly in the first few years of life. For example, Beck and McKeown (1991) claim that 5-6 year old children have an expressive vocabulary of 2500 to 5000 words. In addition, the size of the comprehension vocabulary (i.e. the words understood by the child but not necessarily used expressively) will be higher than this. What does it mean to be “an average literate adult”? What does it mean to “know” a word? 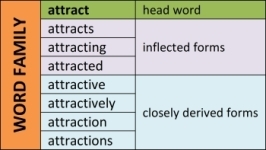 A study by Nation (2006), which used this concept of one word = one word family, showed that an 8000-9000 word-family vocabulary is needed for comprehension of written text and a vocabulary of 6000-7000 for spoken text. Ayto J, (ed) (1999) The Oxford Dictionary of Slang Oxford: Oxford Paperbacks. Beck, I.L. and McKeown, M.G. (1991) ‘Social studies texts are hard to understand: mediating some of the difficulties’ Language Arts 68, 482-490. Burke, P. and Porter, R. (1995) Languages and Jargons: Contributions to a Social History of Language Oxford: Polity Press. Crystal, D. (2006) Words Words Words Oxford: Oxford University Press. James, E. (1999) Contemporary British Slang Lincolnwood, IL: National Textbook Company. Nation, I. S. P. (2006) ‘How Large a Vocabulary Is Needed for Reading and Listening?’ The Canadian Modern Language Review 63, 1, 59-81. Wren, S. (2005) Vocabulary [WWW] http://www.balancedreading.com/vocabulary.html Accessed 27.01.2010.